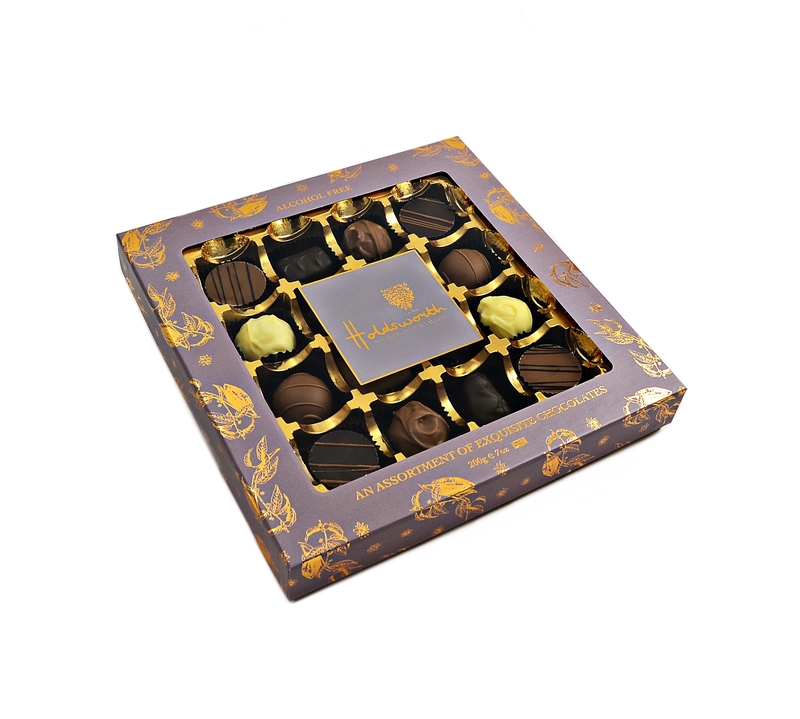 This classic assortment of amazing flavours is alcohol free. This range includes Milk Chocolate Truffle, Hazelnut Praline and Sea Salt Caramel Cup which are firm favourites. 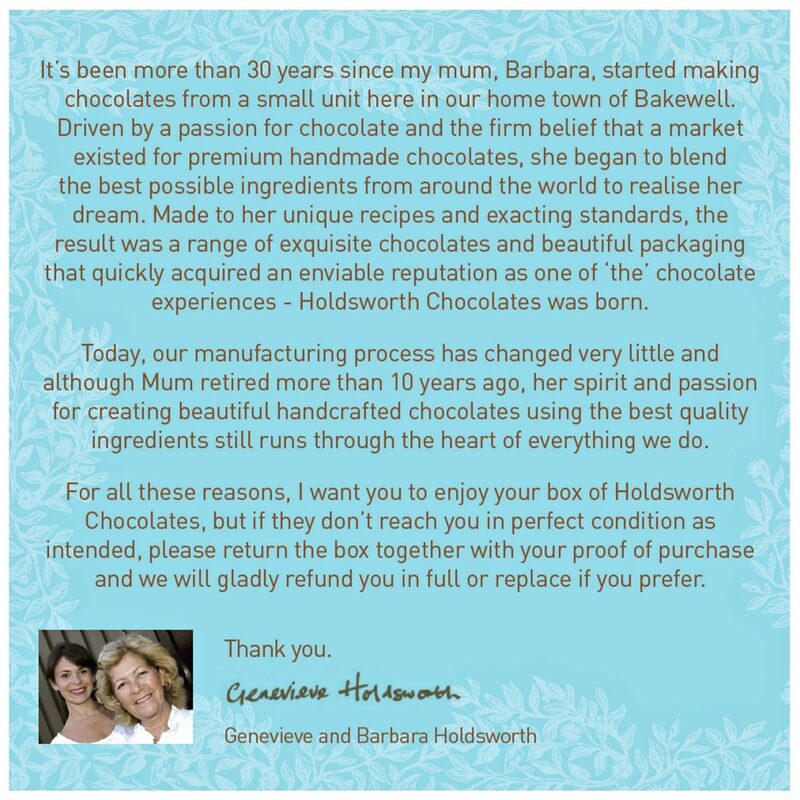 Made with passion & care by the Holdsworth team of chocolatiers using only the finest ingredients. This box is perfect for the whole family to share. Also available in Signature Assortment – Click to view. Ingredients: Milk Chocolate (Sugar, Cocoa Butter, Whole Milk Powder, Cocoa Mass, Emulsifier: Soya Lecithin, Natural Vanilla), Dark Chocolate (Cocoa Mass, Sugar, Cocoa Butter, Emulsifier: Soya Lecithin, Natural Vanilla), White Chocolate (Sugar, Cocoa Butter, Whole Milk Powder, Emulsifier: Soya Lecithin, Natural Vanilla), Butter (Milk), Caramel (Glucose Syrup, Sweetened Condensed Skimmed Milk, Sugar, Water, Cocoa Butter, Modified Starch, Thickener: Agar, Flavours, Emulsifier: E471-Sunflower Lecithin, Salt, Acidity Regulator: Citric Acid, Preservative: Potassium Sorbate), Fondant (Sugar, Glucose (Wheat), Water, Preservative: Sulphur Dioxide), Praline Paste (Sugar, Hazelnuts, Emulsifier: Soya Lecithin, Natural Vanilla), Fudge ( Sugar, Glucose Syrup, Sweetened Condensed Milk, Palm Oil, Butter (Milk), Emulsifier: Soya Lecithin, Flavouring, Salt ), Turkish Delight (Sugar, Maize Starch, Cream of Tartar, Lemon Oil, Colouring (Hibiscus, Apple, Carrot, Radish & Red Cabbage Extract, Natural Rose Flavouring), Salt Crystals. Absolutely delicious. Was bought as a Christmas gift for my chocoholic partner by my Mum as he doesn’t like alcohol in chocolates and he absolutely loved them. He said the Turkish delight one was especially amazing. Would definitely buy these again for friends and family. Quality all the way!